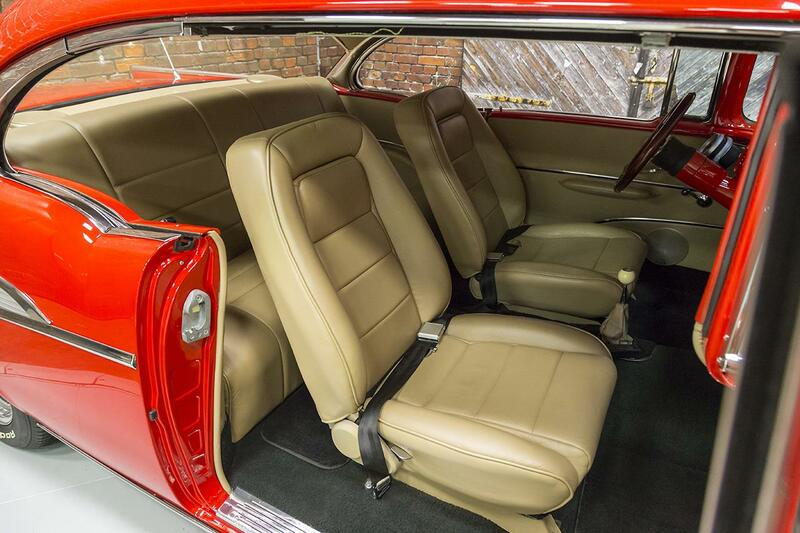 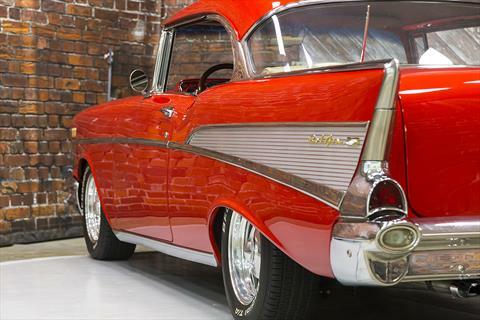 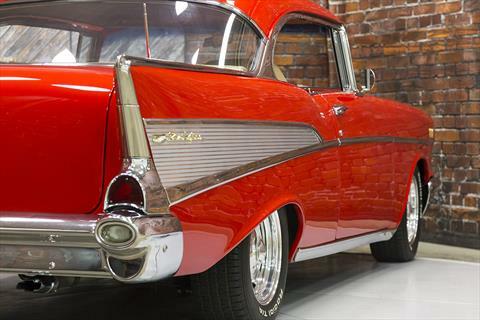 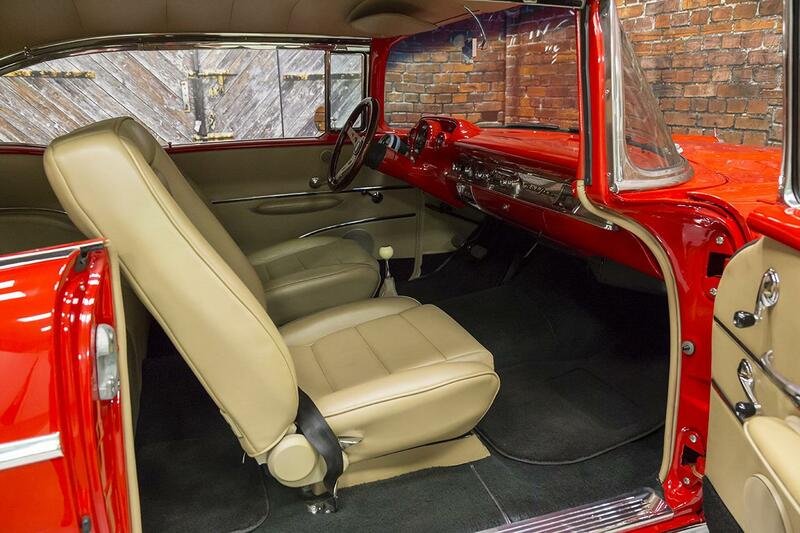 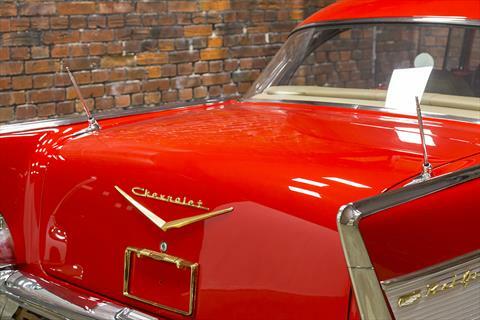 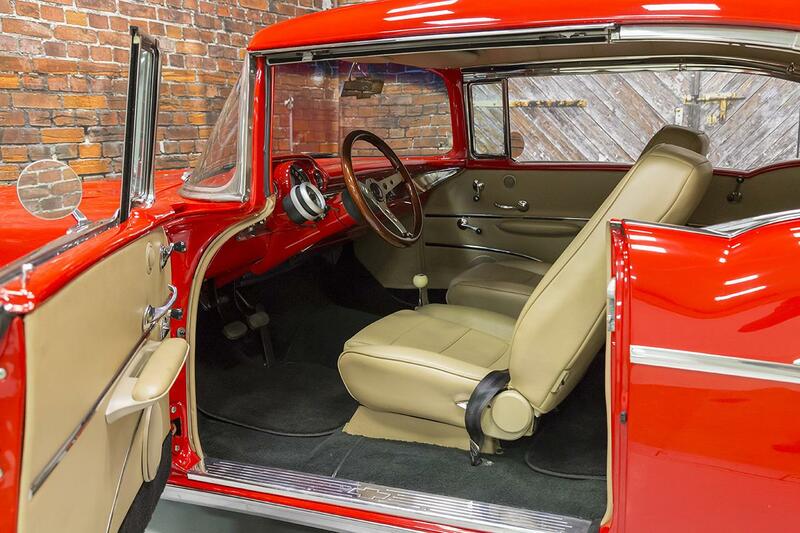 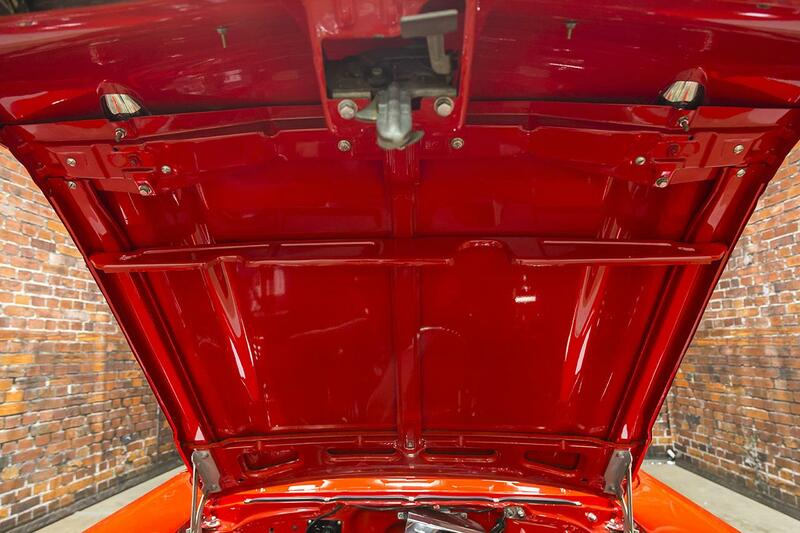 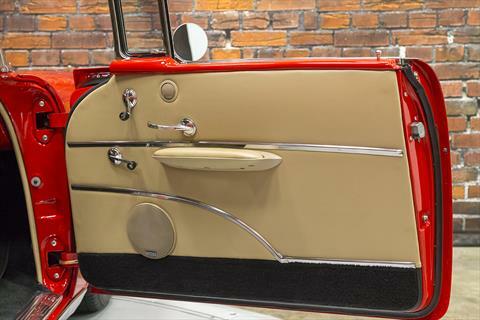 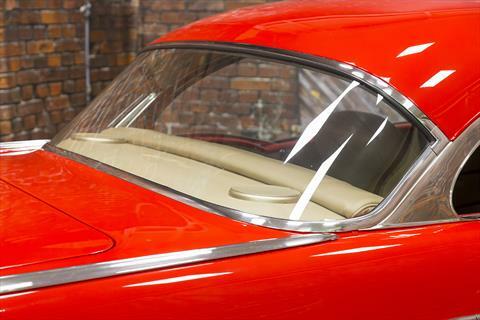 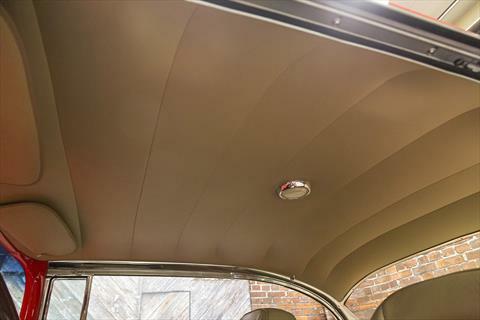 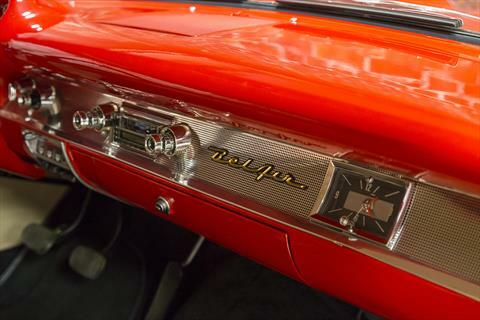 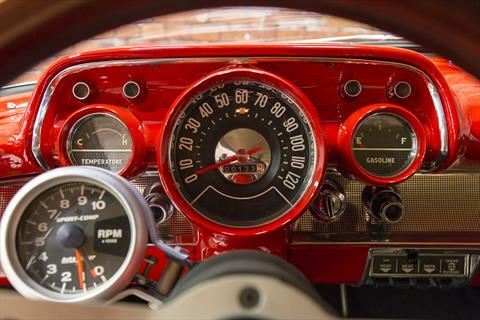 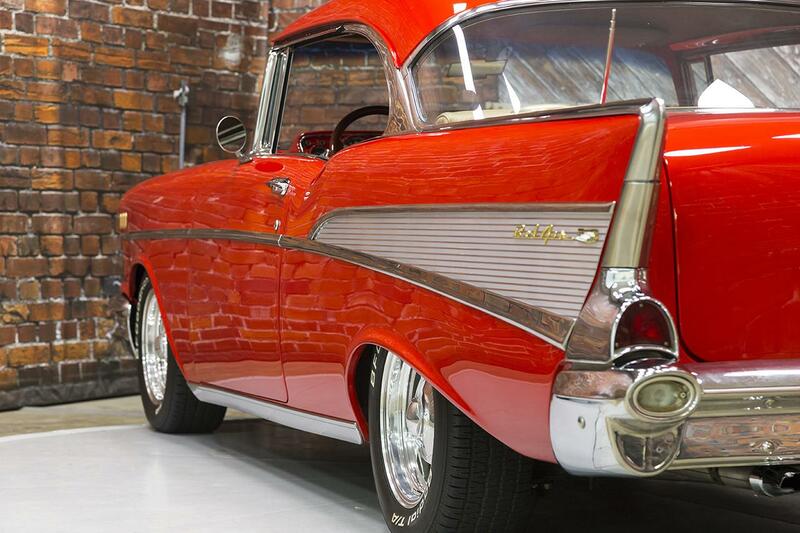 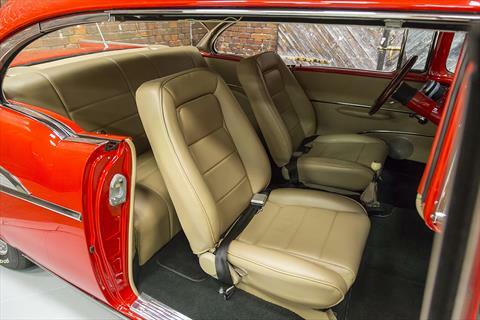 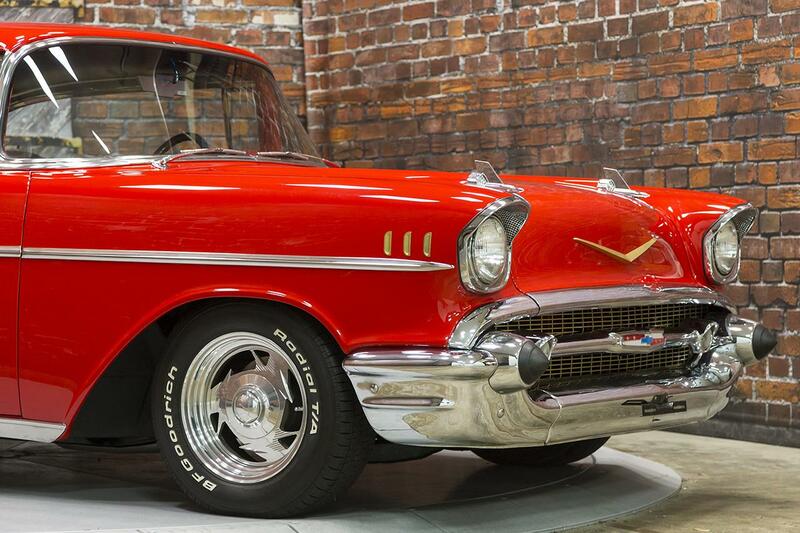 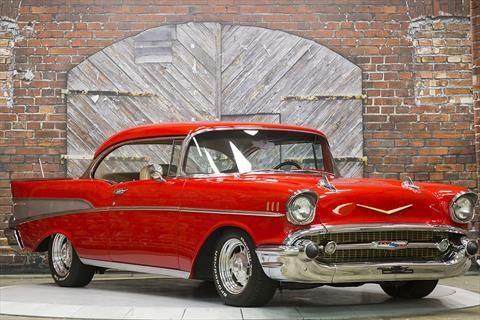 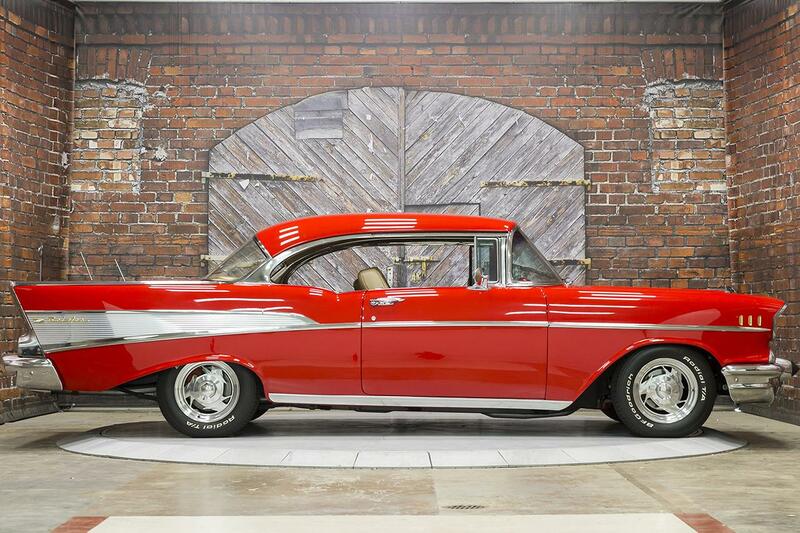 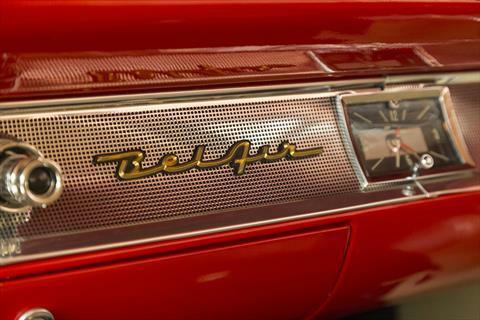 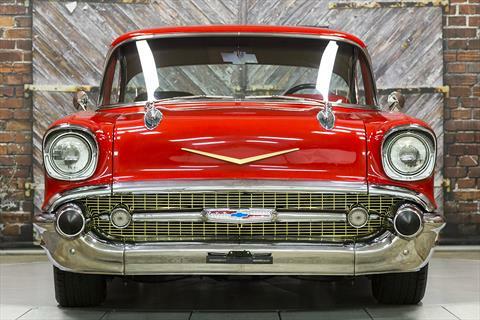 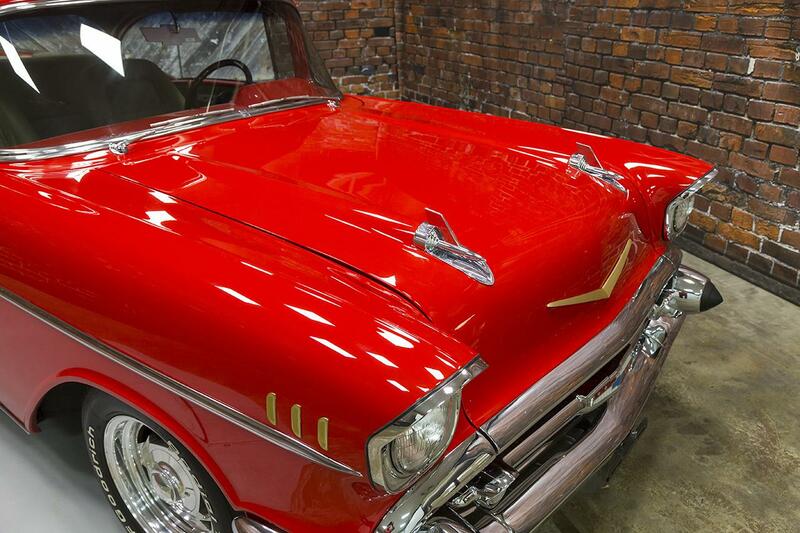 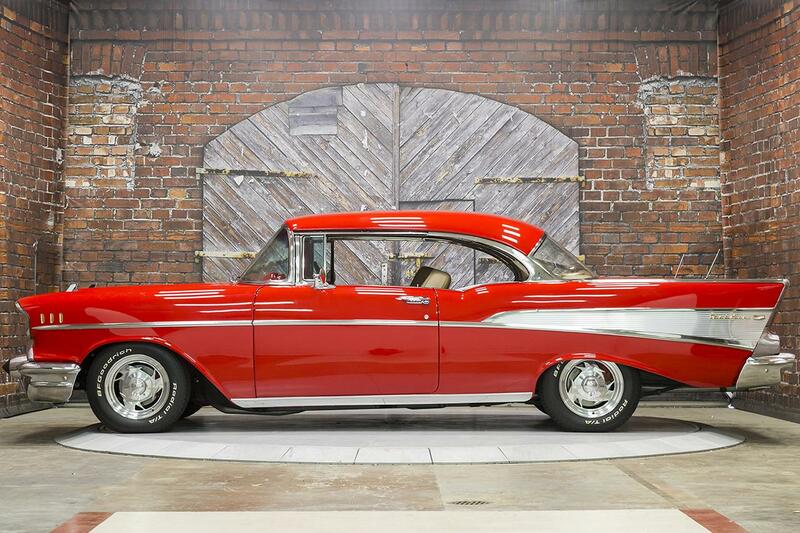 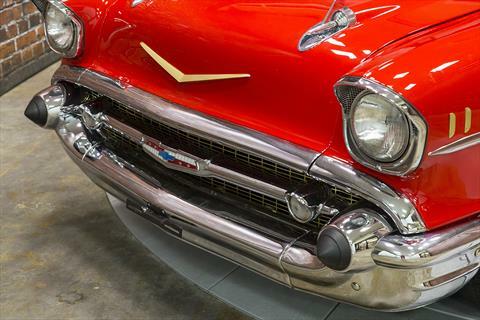 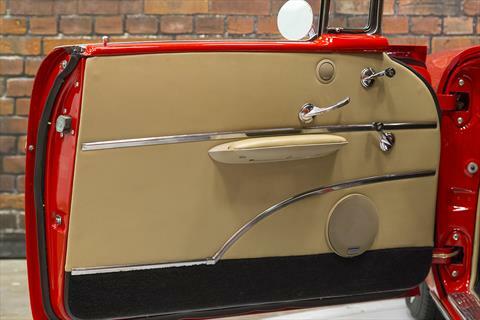 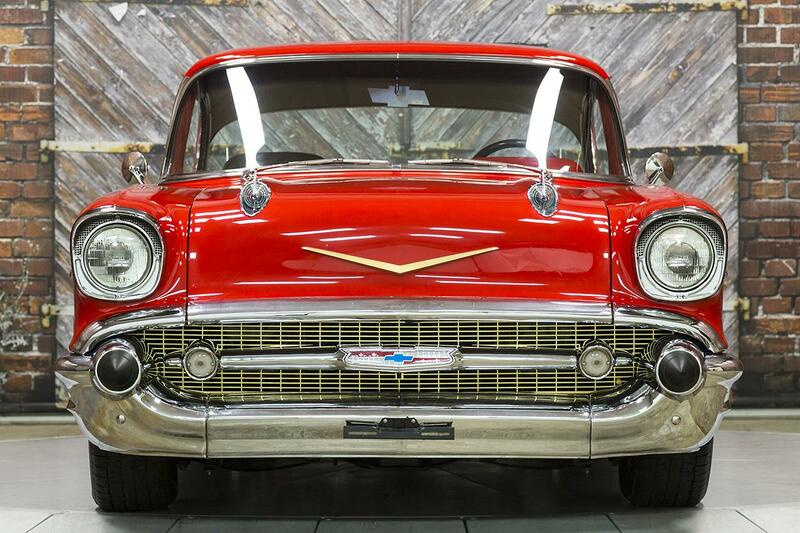 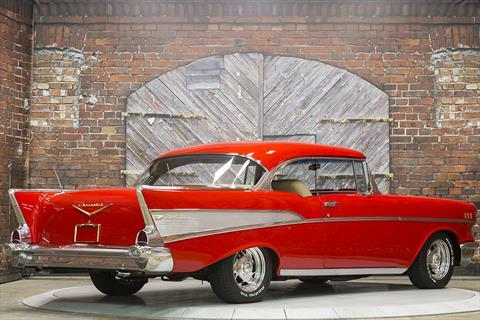 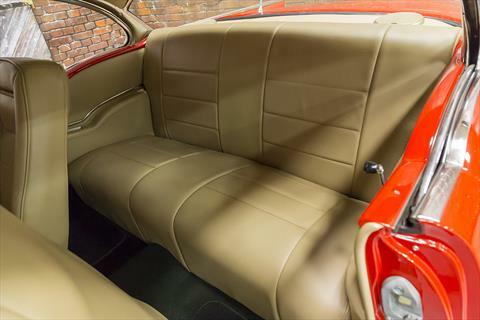 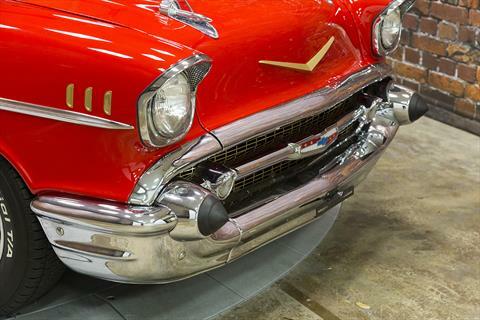 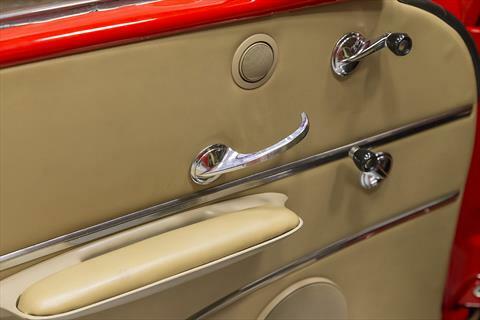 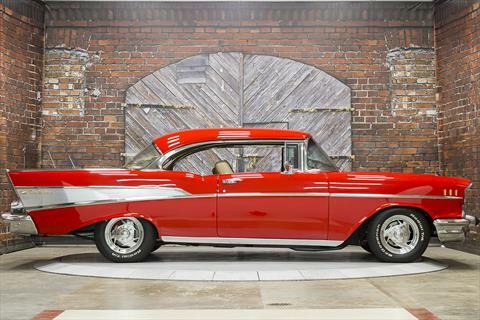 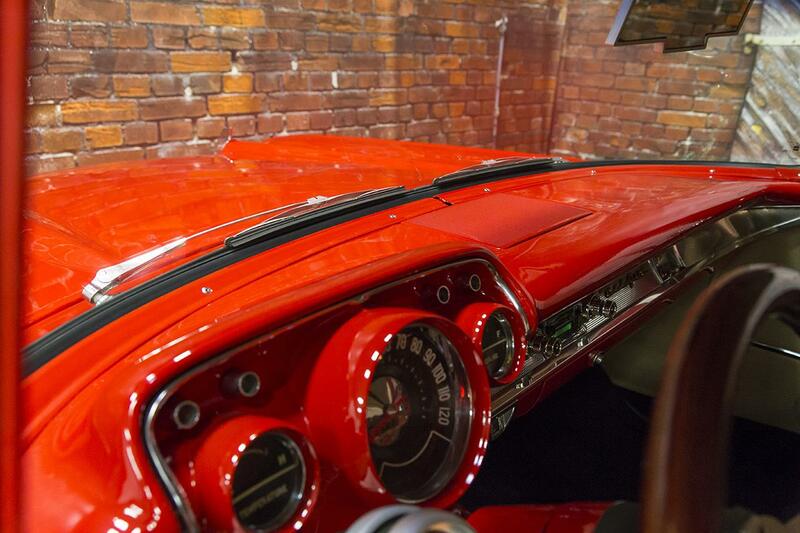 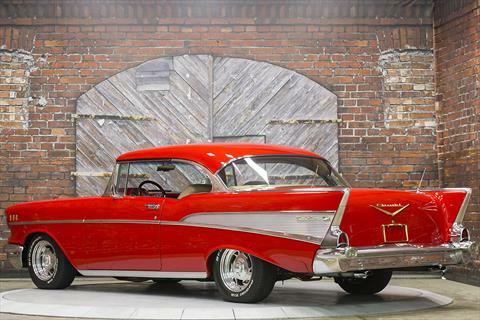 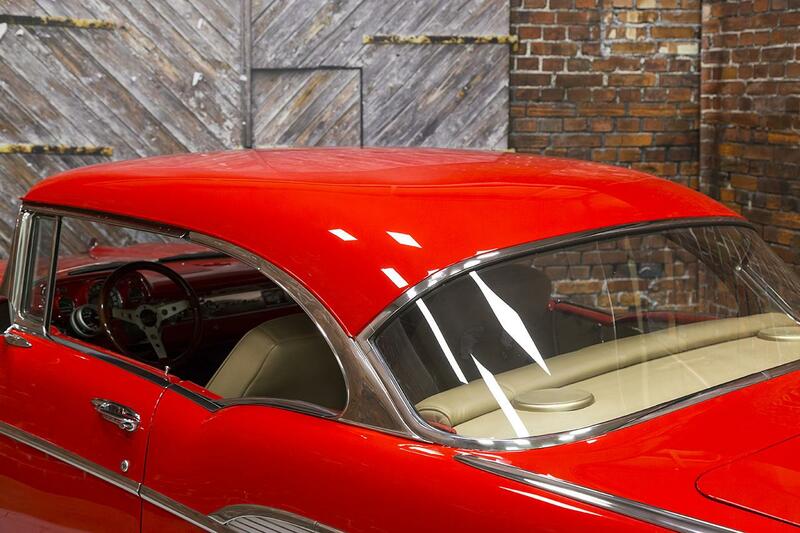 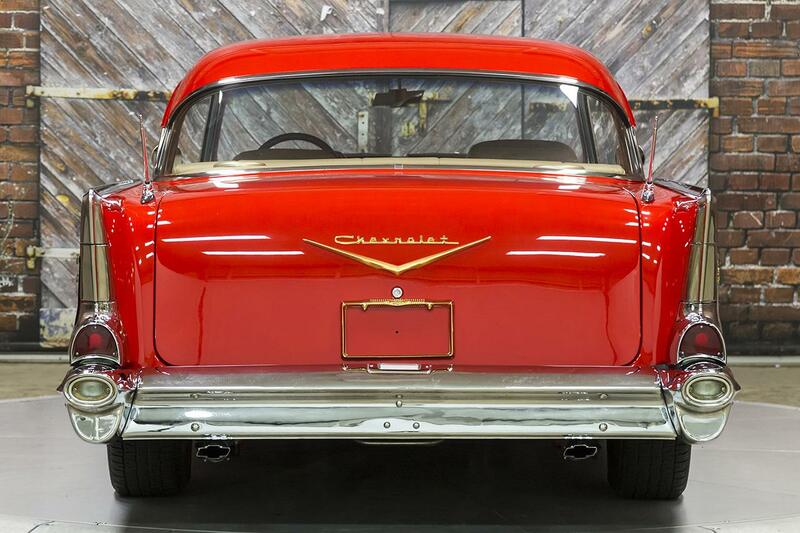 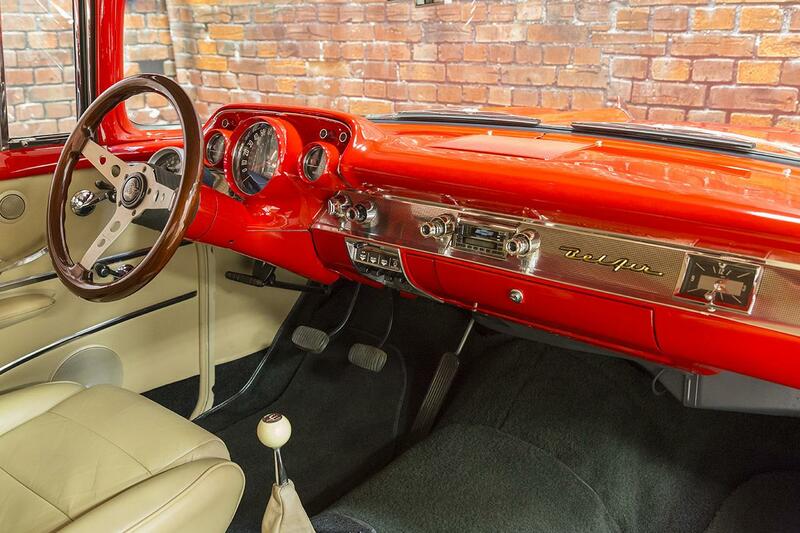 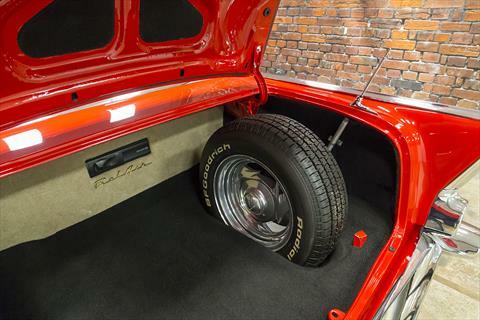 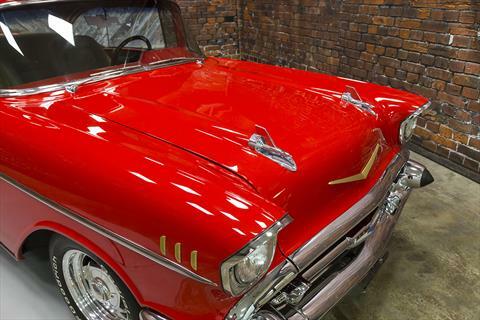 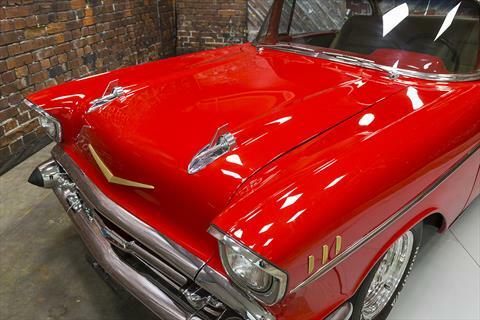 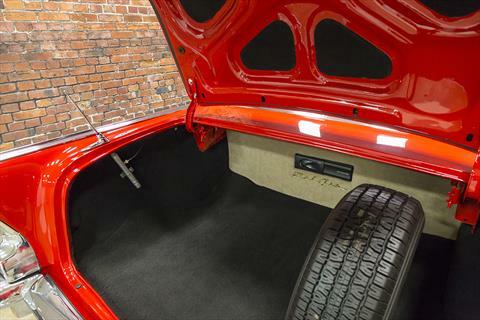 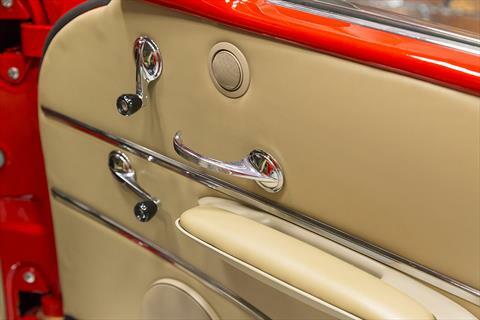 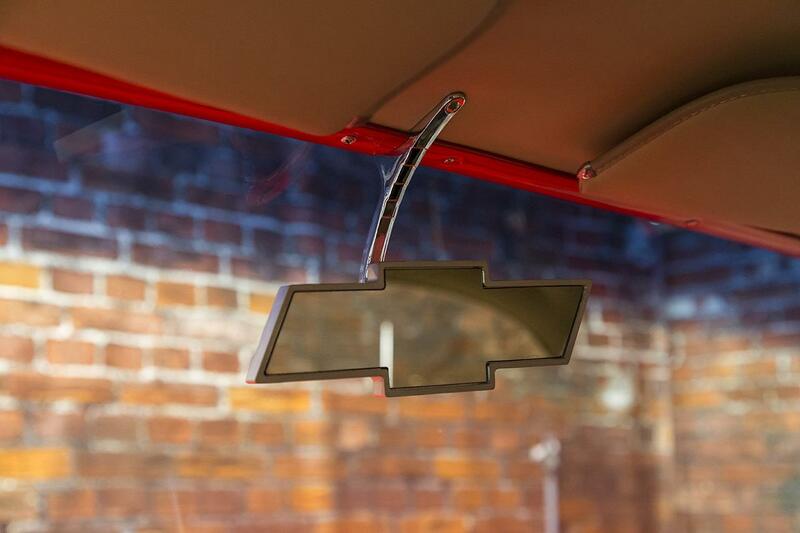 Exotic Cars of Houston proudly offers this Beautiful, Frame-off Restored, Restomod 1957 Chevrolet Bel Air Sport Coupe 4-Speed Manual in single-stage Red over a Tan fine-grain leather interior. 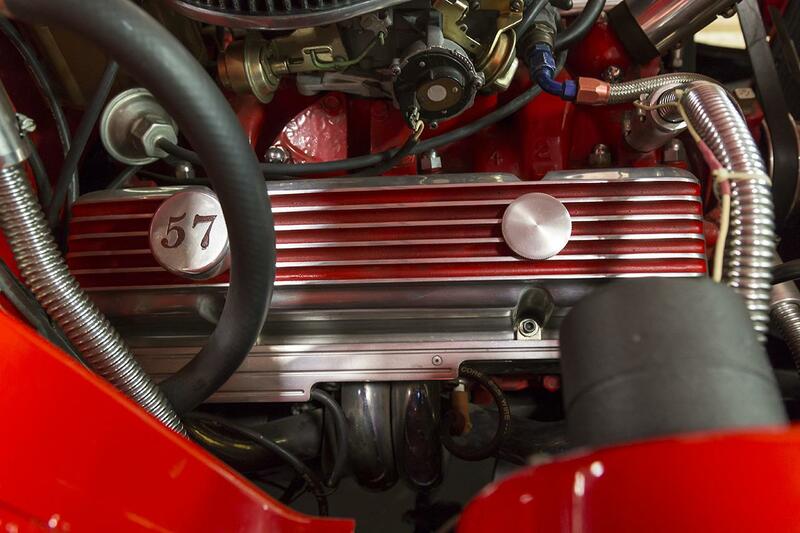 Powered by a 450 hp small block “stroker” 383 c.i. 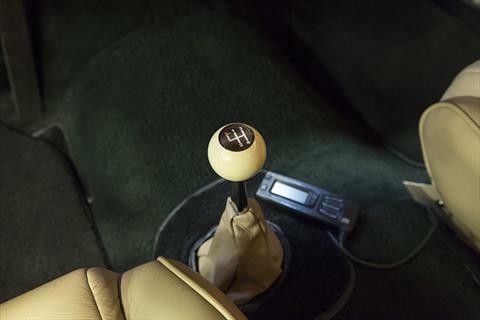 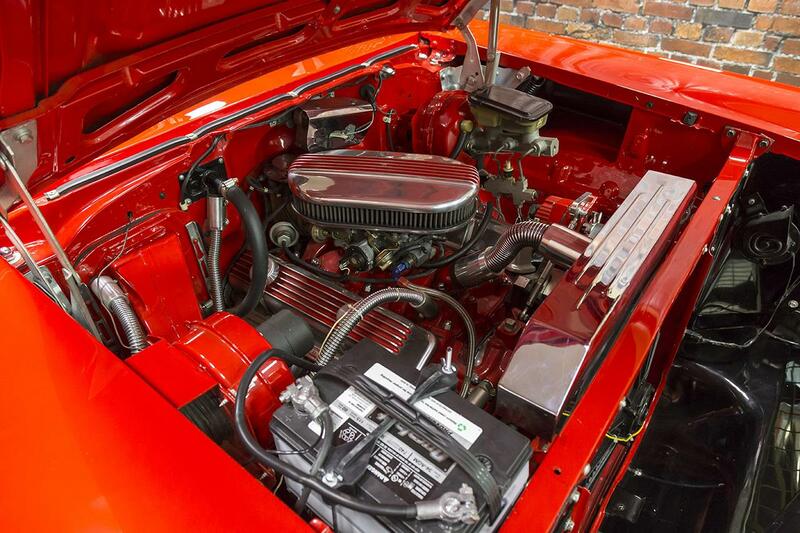 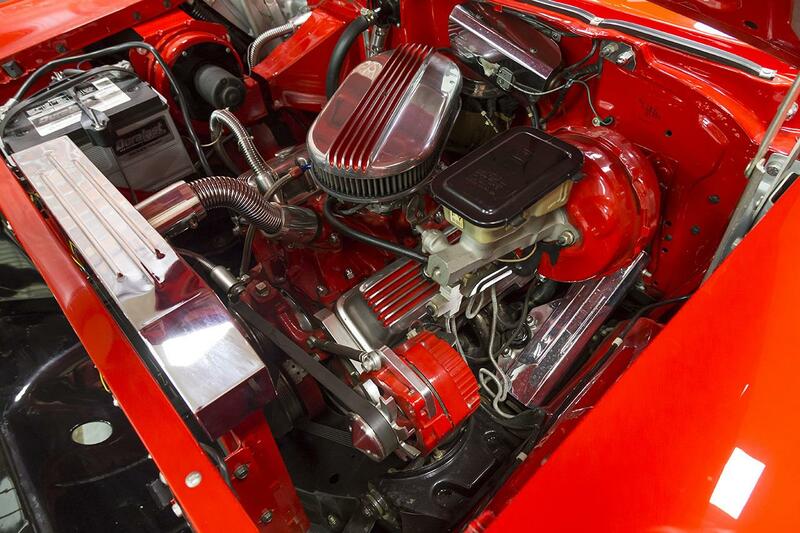 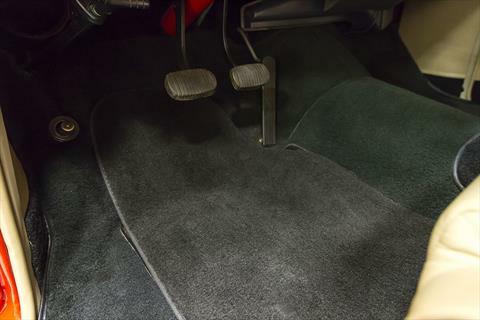 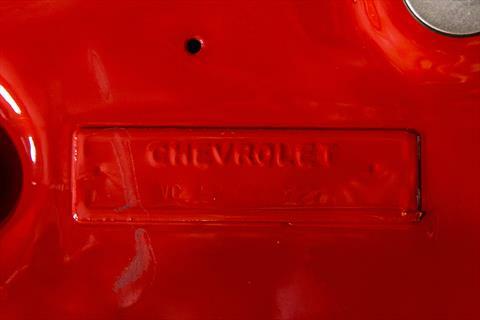 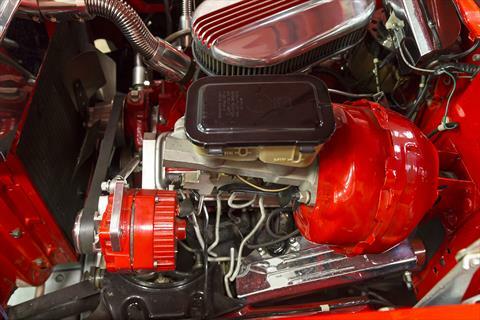 OHV V8 engine through a Muncie close ratio 4-speed manual transmission with Hurst quick shift. The odometer currently reads 133 miles. This stunning example was formerly a part of the Sam Pack Collection and has accrued nearly 30 Best-of Show awards. 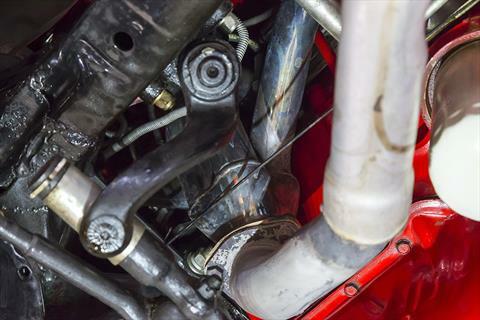 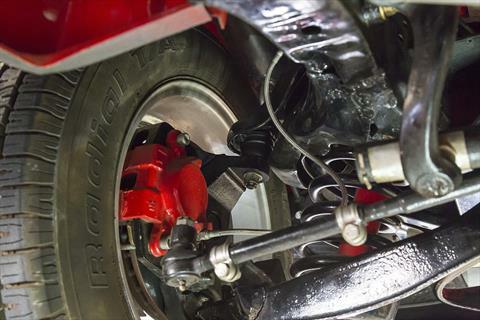 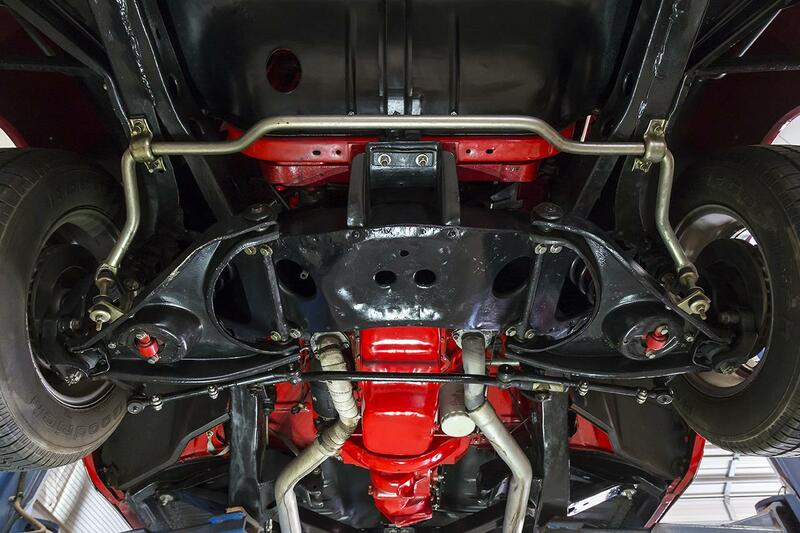 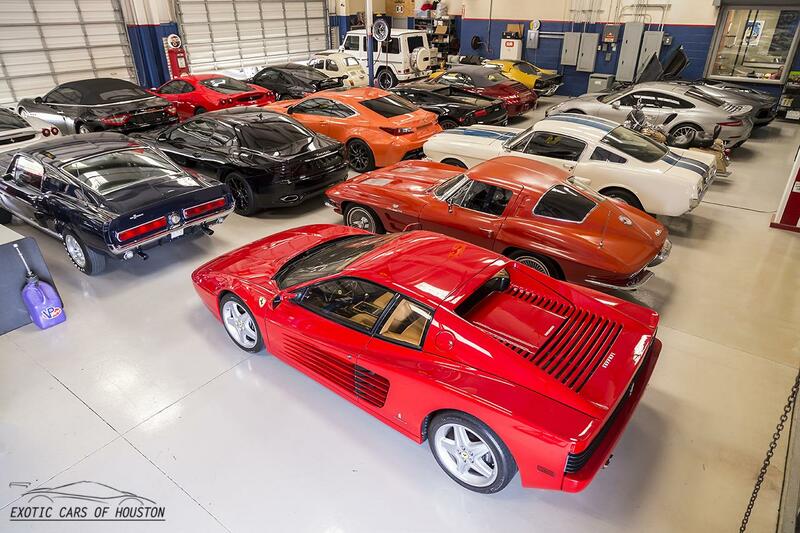 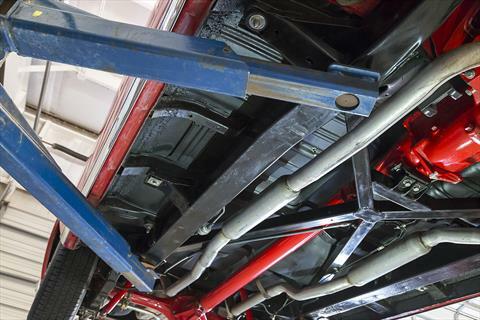 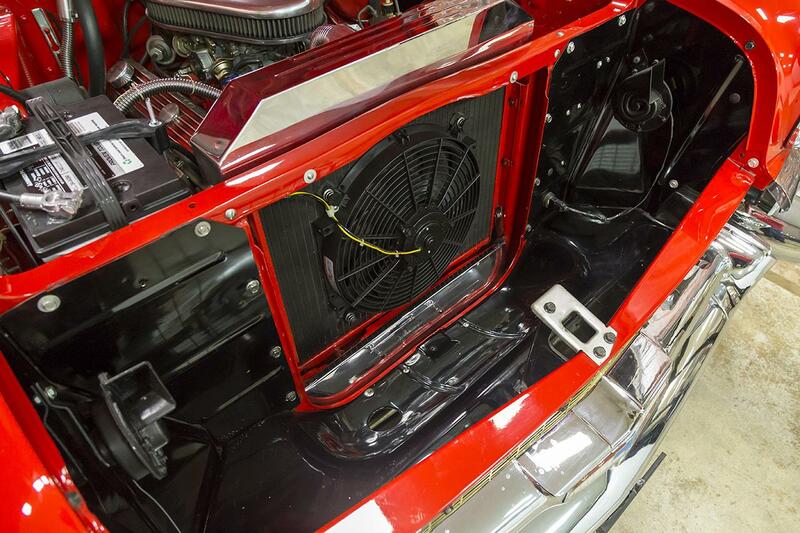 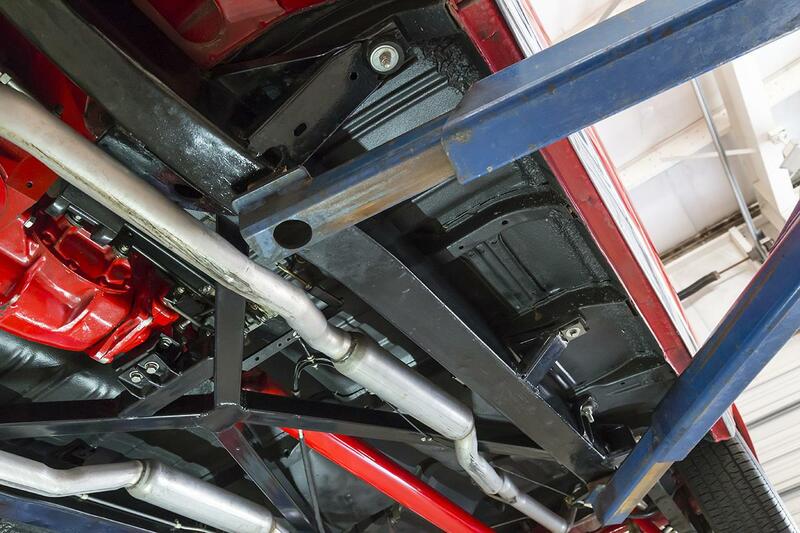 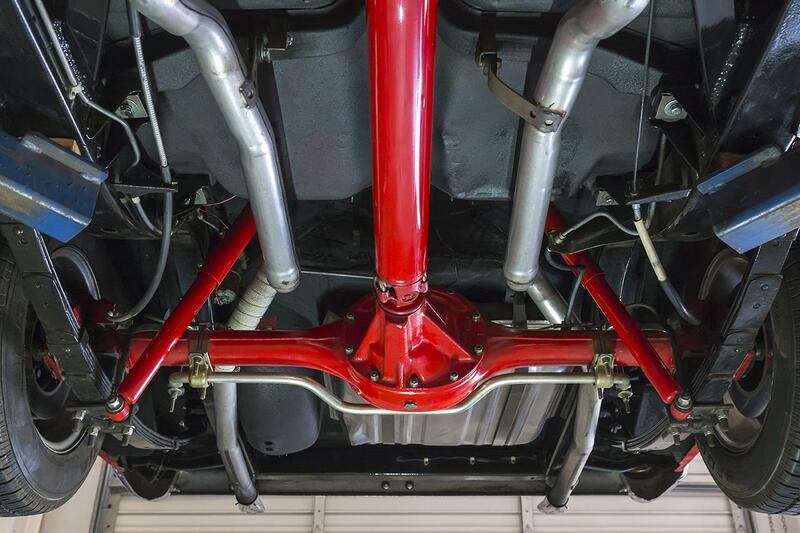 Prior to being purchased for the Sam Pack Collection, the car received a full frame-off, complete rebuild. 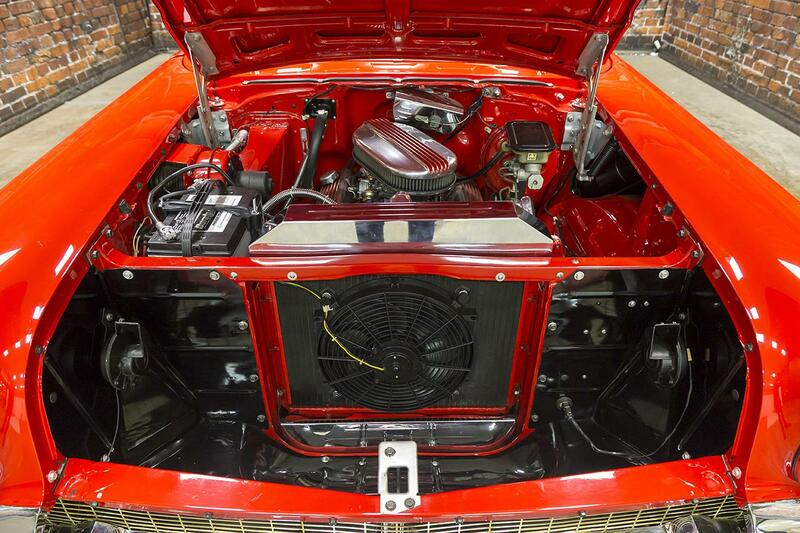 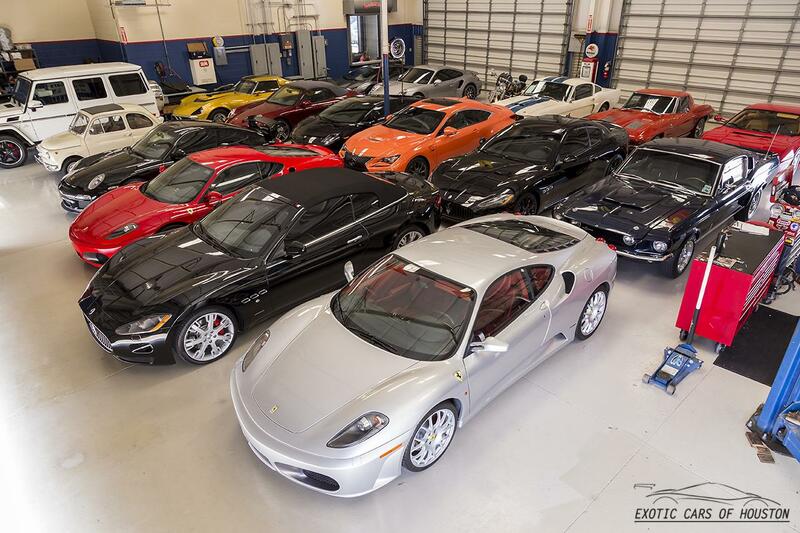 Every single painted part was completely redone, including treatments under hood with billet aluminum, trunk, all chrome redone or replaced, frame powder coated, and stainless redone. 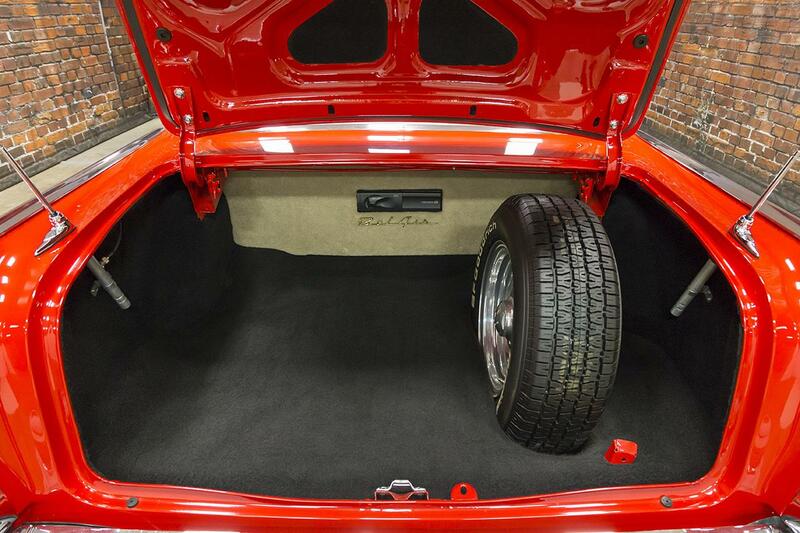 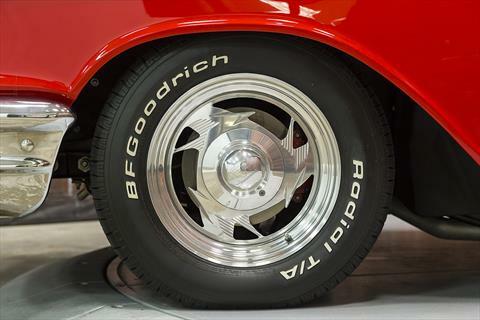 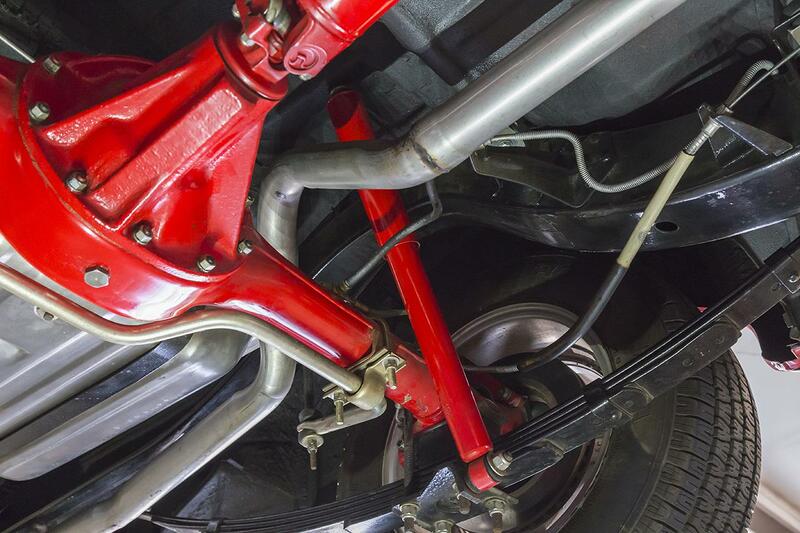 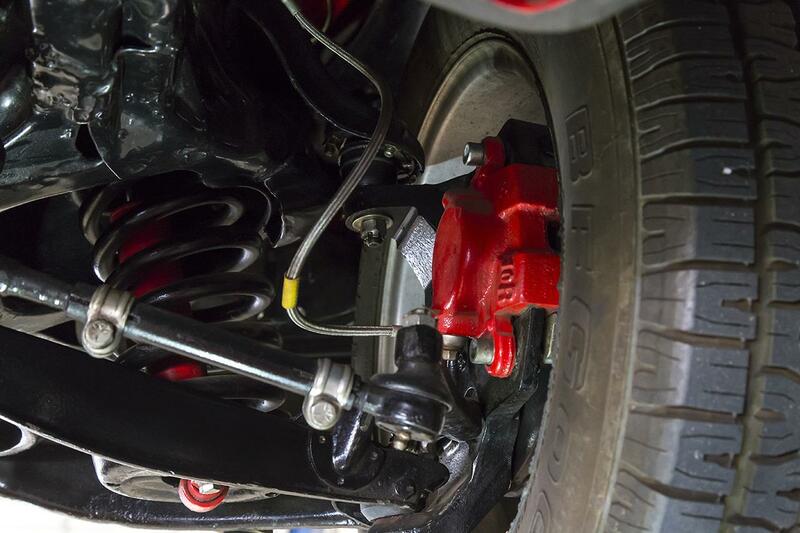 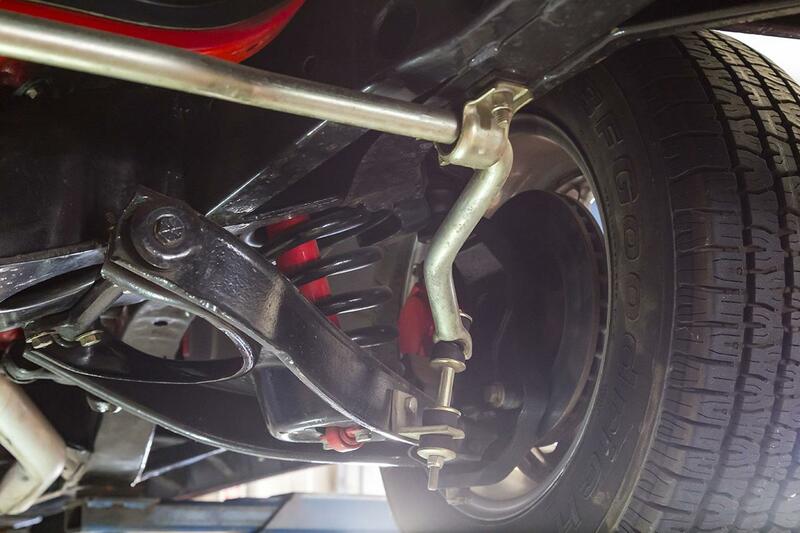 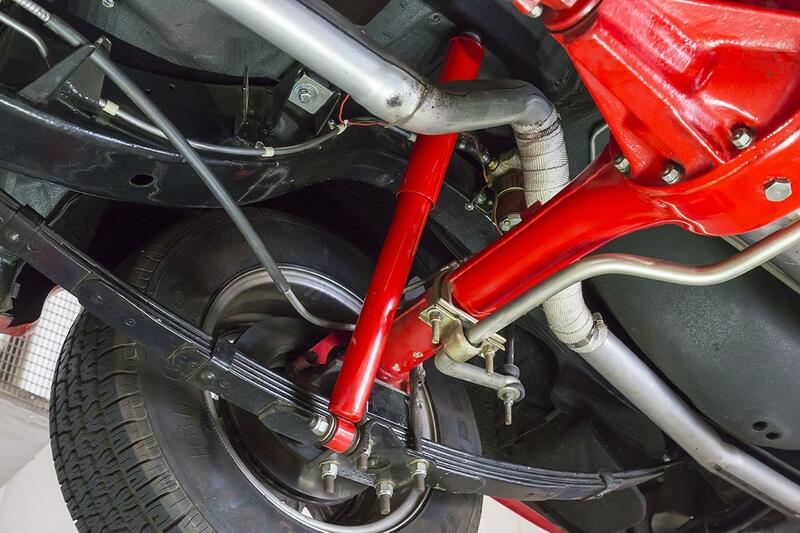 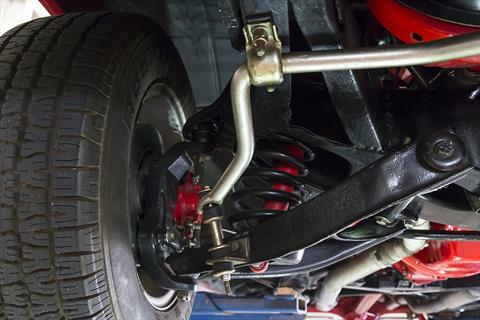 The car has 4-wheel power disc brakes and lowered suspension on 15 inch BF Goodrich tires on custom alloy wheels. 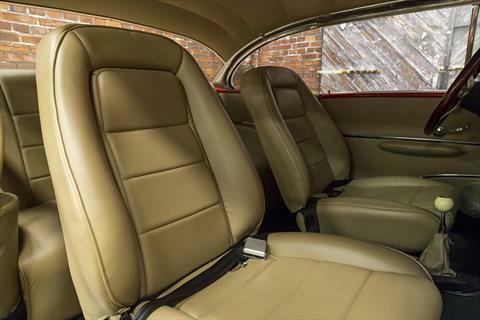 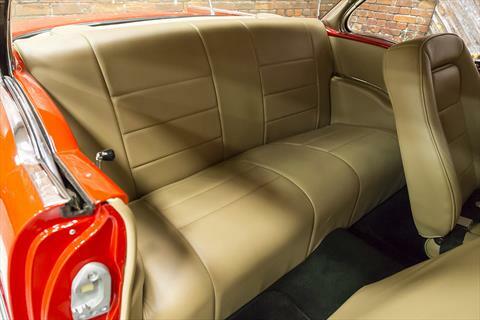 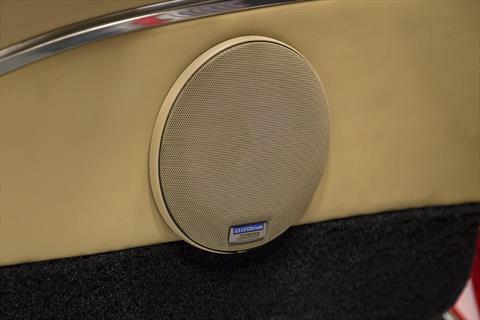 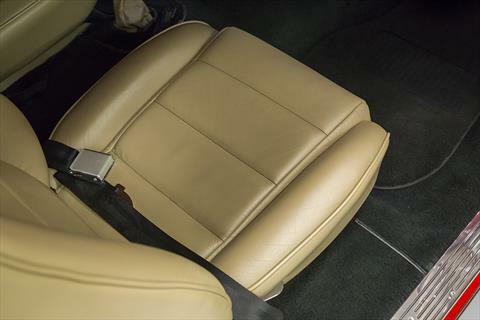 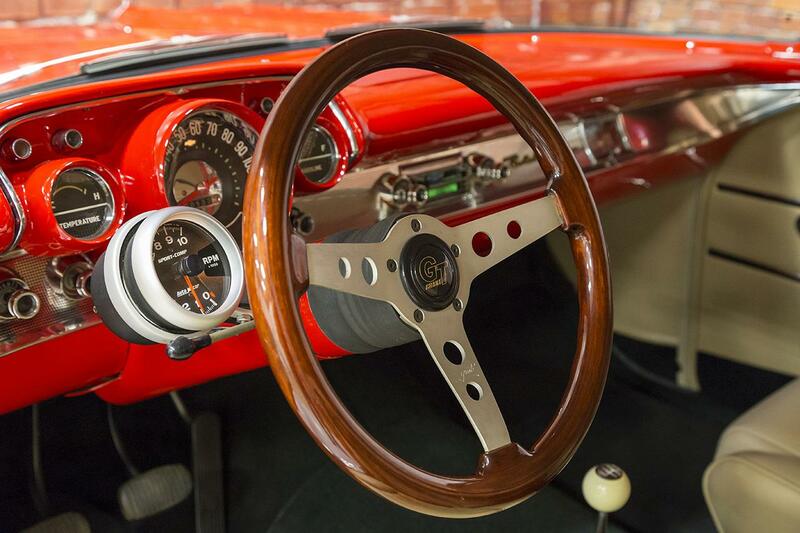 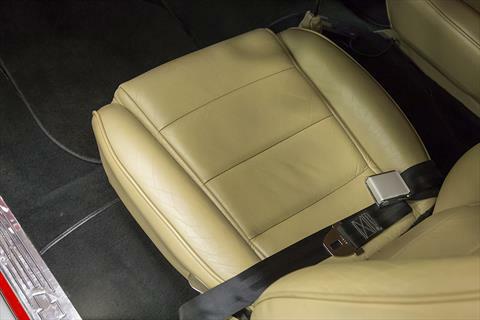 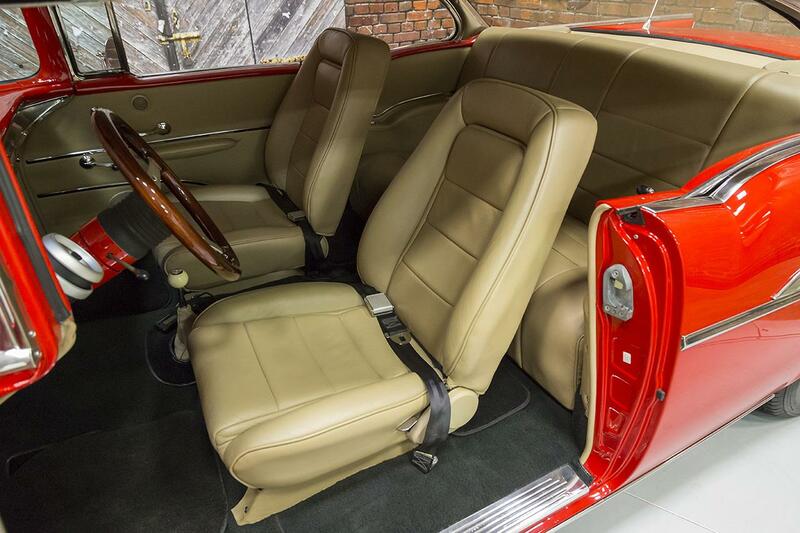 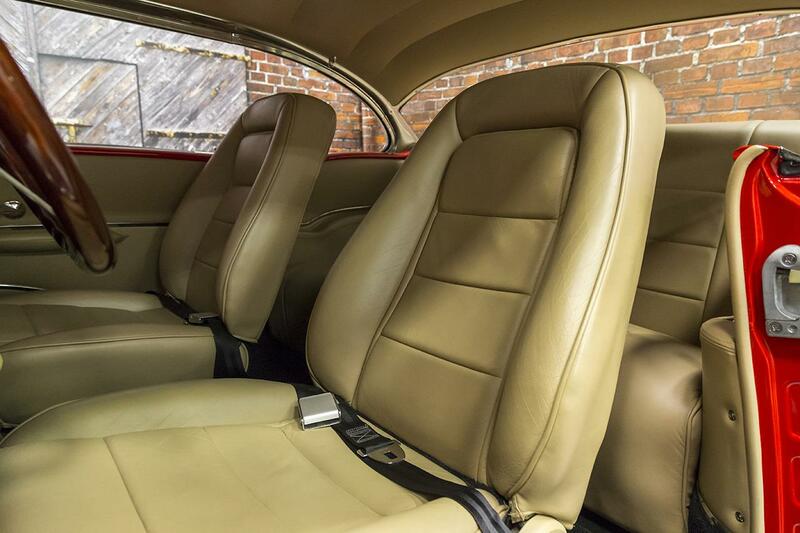 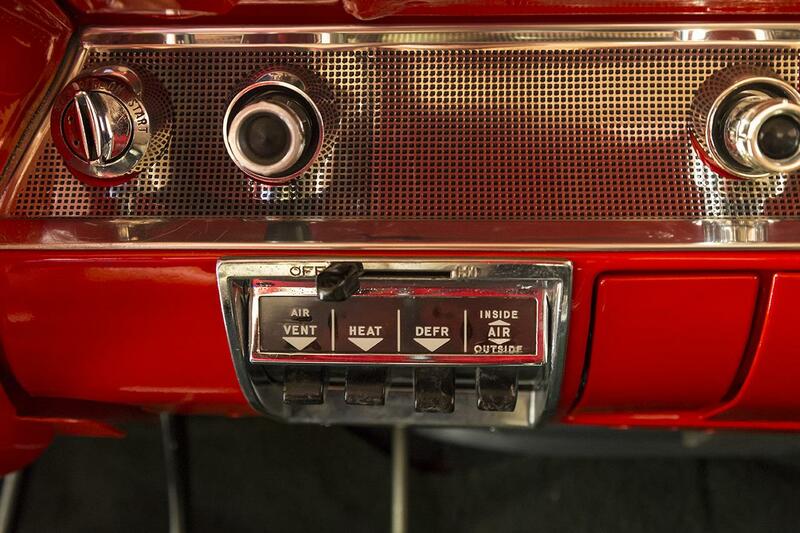 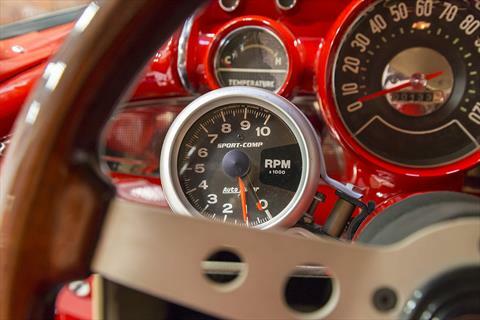 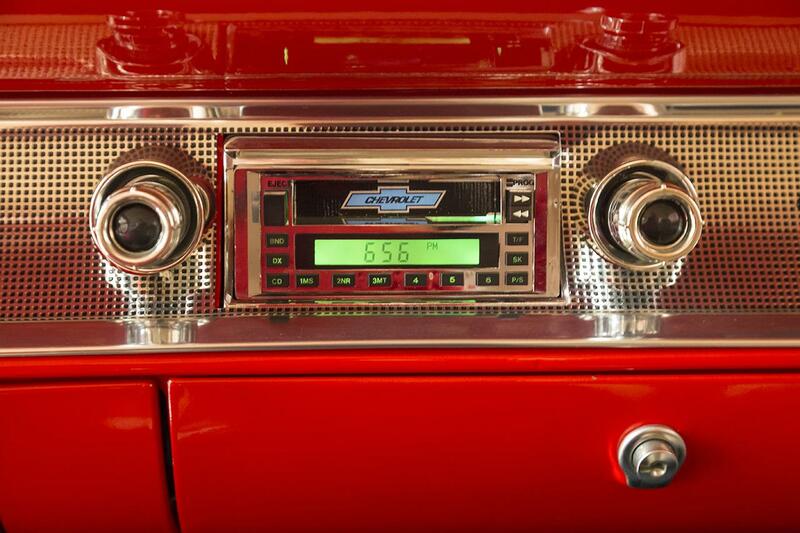 The interior features a Kenwood stereo with Alpine speakers and remote CD changer, AutoMeter Sport-Comp tachometer mounted to the steering column, and wood steering wheel. 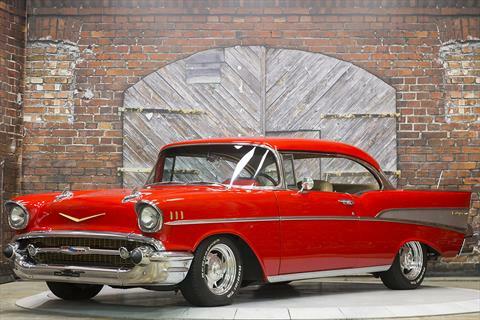 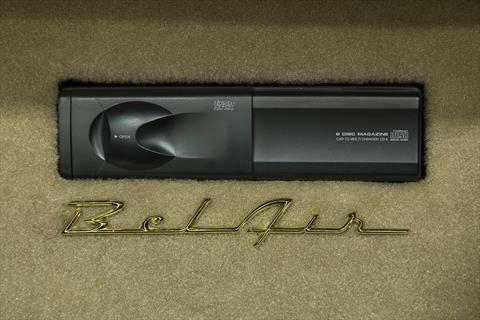 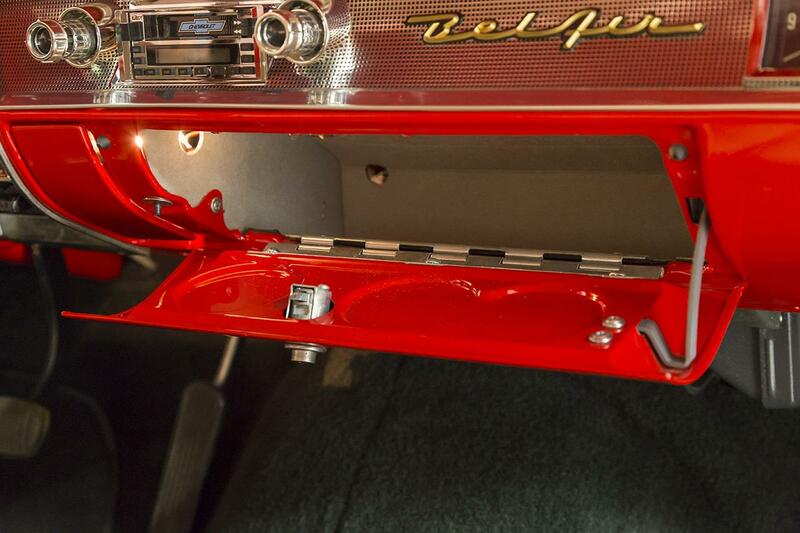 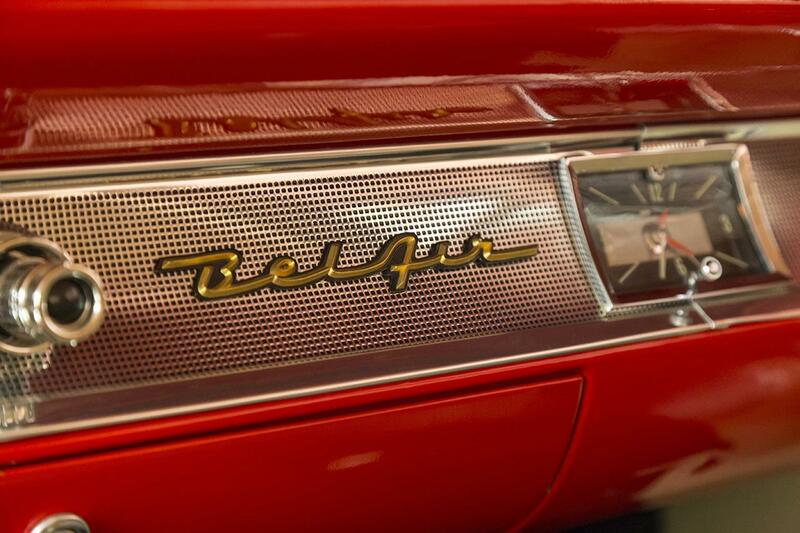 This Bel Air Sport Coupe is a find. 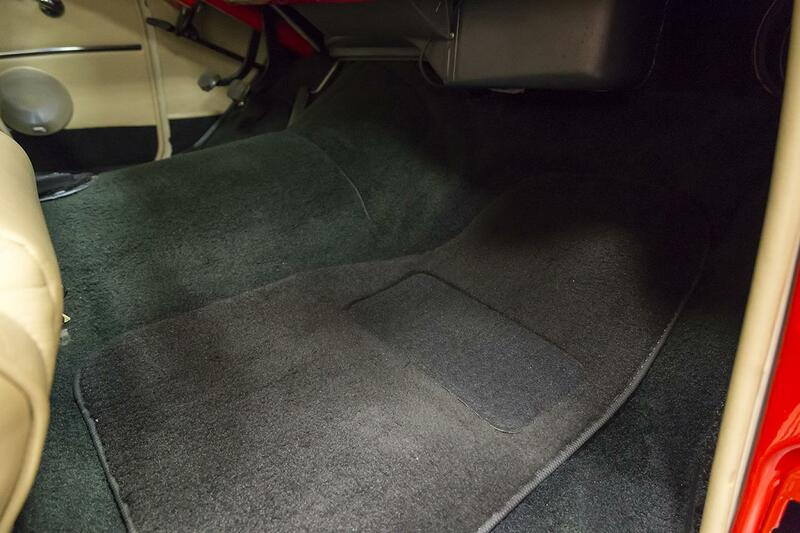 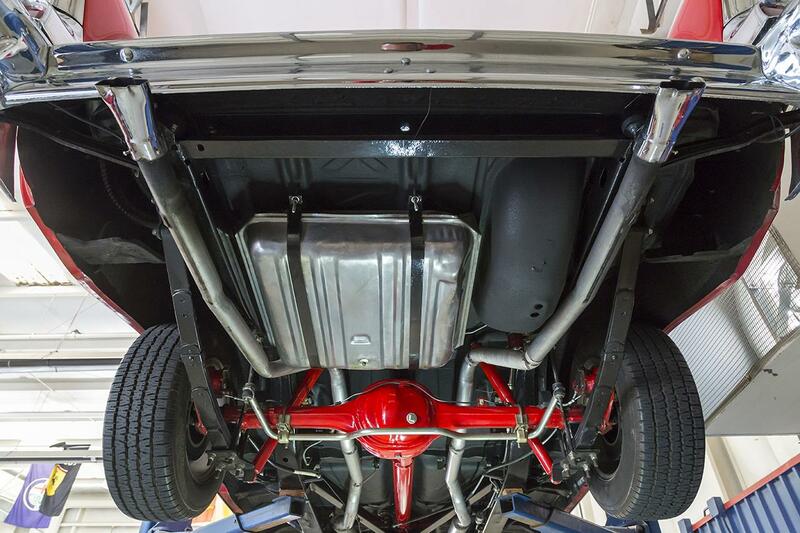 Be sure to view the included pictures of the underside. 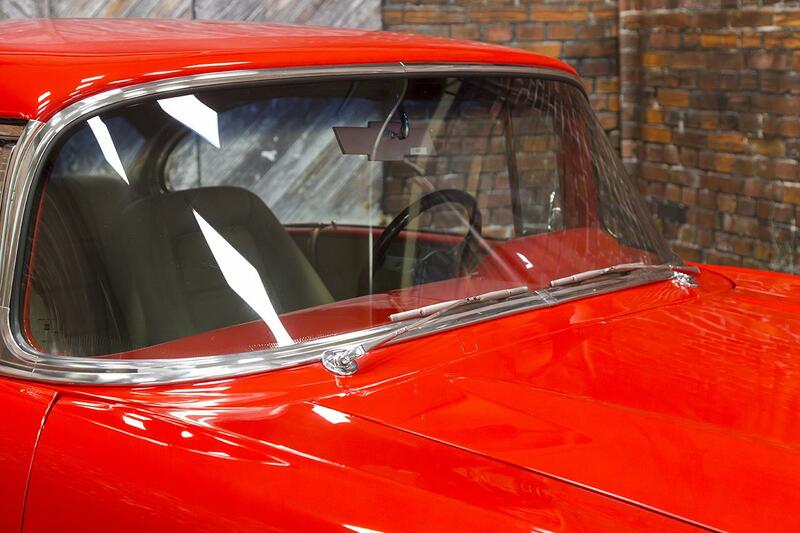 It is clear a lot of time, money, and care were spent building this show piece. 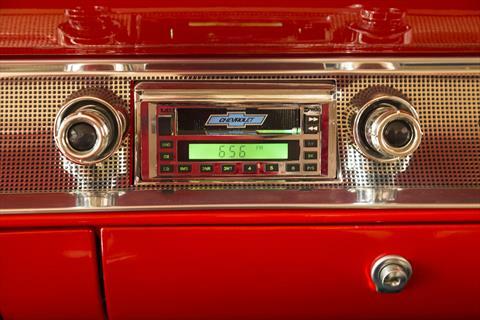 But wait till you hear it! 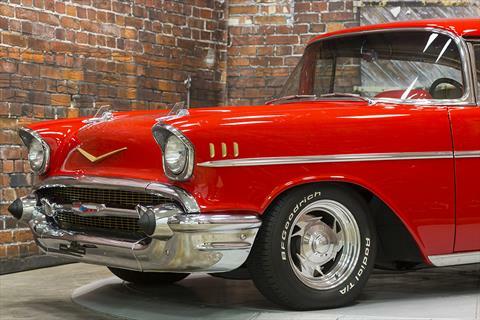 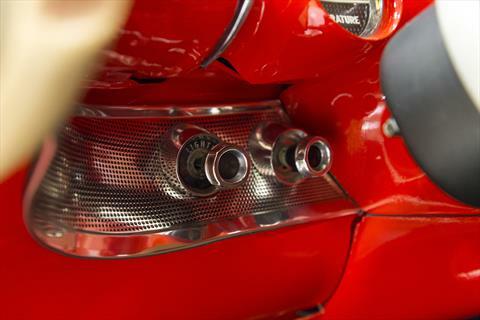 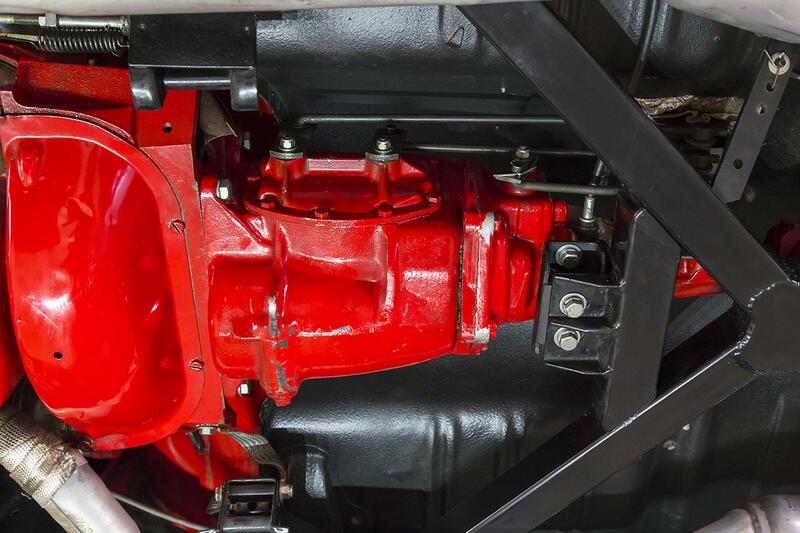 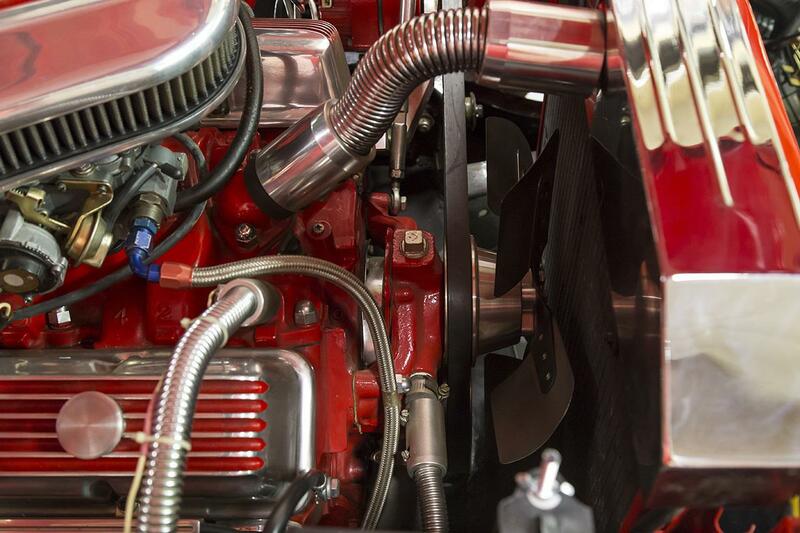 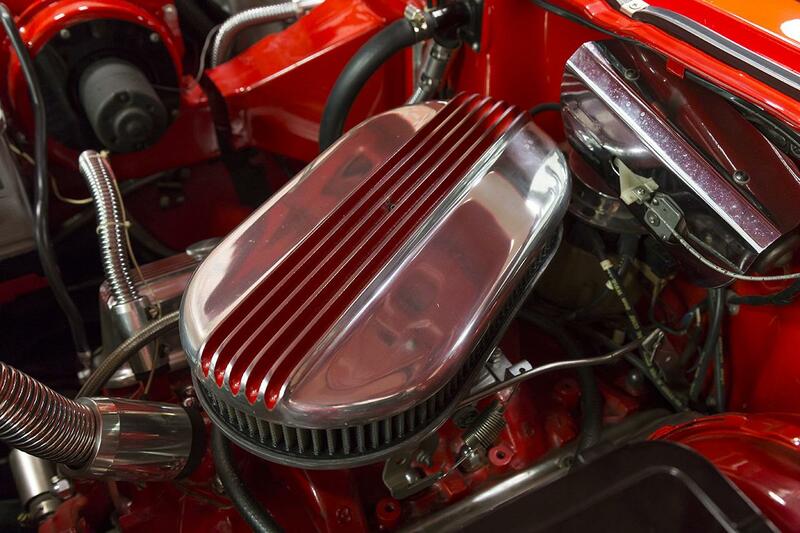 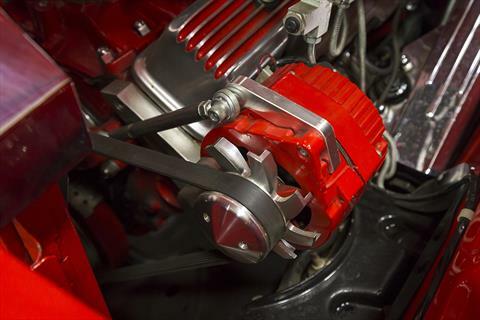 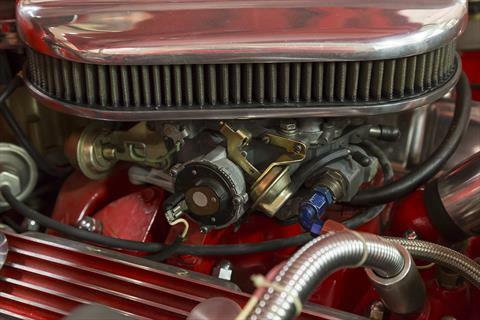 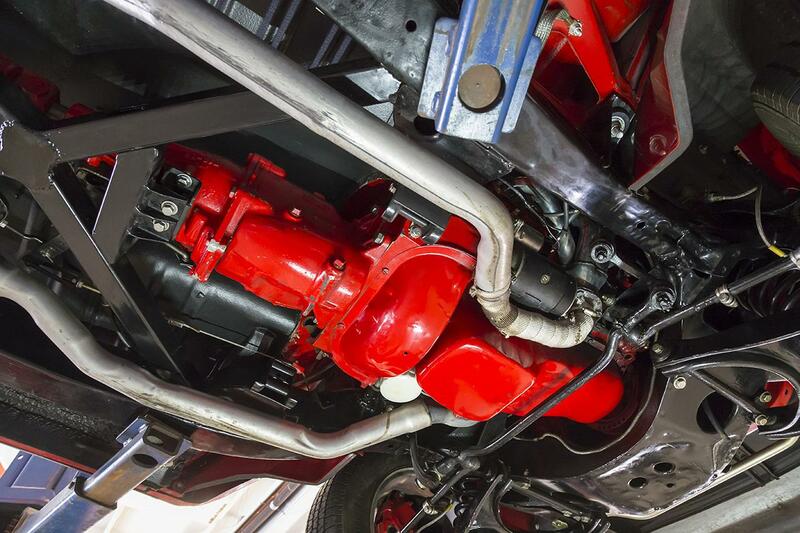 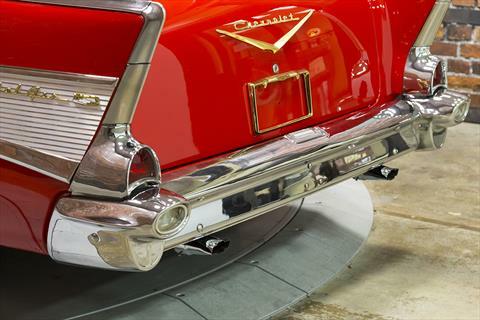 The sound of the engine’s gear drive gives it an attitude befitting this lowered ’57 Chevy’s look!